I am awaiting id confirmation on these two insects. 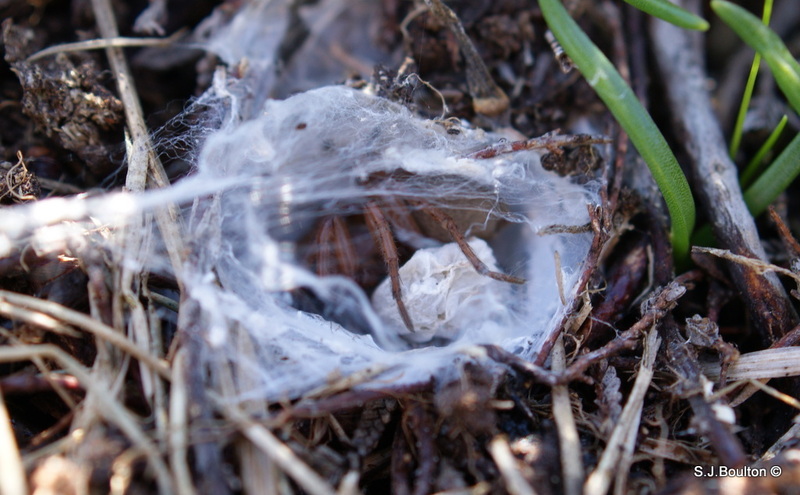 A type of Stone spider in its nest with an egg sack. Restricted to southern England, Channel Islands, Wales and north to Northumberland. It is gradually replaced by the closely related L. cupromicans towards the north, and in upland situations, particularly in the South-west. The species has a generally Mediterranean and Atlantic distribution in Europe. It is also known from north Africa. This bee is not regarded as being scarce or threatened. However, the species does seem to have declined nationally in recent years (G R Else, pers. comm. & M Edwards, pers. obs.). Although L. smeathmanellum may be encountered almost anywhere in southern England and Wales, it is often abundant on coastal soft-rock cliffs. Inland it is frequently reported as nesting in the soft mortar of old walls. Females fly between late March and September, males are found between July and September. As with all British Lasioglossum, only mated females hibernate. Often nests communally in suitable areas of old walls and bare cliffs, but is not known to be eusocial, with a queen and a few workers. Excited folks, I made a wrong Id the other day this is not a fresh Andrena carantonica. It is a faded but very late Andrena thoracica I did not consider this bee because its known flying time ends in August. This species is locally common in coastal localities in southern Britain, but is also known from a number of inland sites, often on heathy soils, where it rarely attains the abundance of some of its coastal locations. Males patrol nesting areas, flying extremely quickly along the edge of cliffs, just below the top edge. It is widespread, but rarely common, in Europe. It is also found throughout the steppe regions of Asia. May be found in open, sandy-grassland habitats, particularly where these are associated with exposed vertical cliffs, which provide the favoured nesting sites. Strongly associated with vertical cliffs of sandy material, but may also use more level sandy areas.